So this is for a herb garden? Medicinal herbs of course. The bird start fiber plants here all the time. is see the weed plants at the bottom smart move take a photo were i grow my weed. Actually, they are tomatoes, Roma Hybrids actually to be specific… Yep, I have lots of pics to prove it. Thanks! Love the comments. Just to clarify, I grow between 50 and 75 tomato plants per year and donate them to needy families and organizations to help people out. I live in Utah and it’s not a place to grow alternative crops even if I had an interest. Indoor yields and jump starting plants each year is absolutely an interest and having that independence is a fun and rewarding hobby. I’m sure this is only room for the growing seedlings. to the quantity of cuttings can be seen, there is still a large growth chamber. this is not a culture for their own use but a grower of weed. since this thing for large plants is not suitable. Believe it or not some people are still interested in growing legal (I know weed isn’t illegal everywhere and admittedly I would if I could) plants and starting from seed indoor is a cheaper way to grow. Fluorescent lights wouldn’t grow a very happy looking mature plant either (weed or tomatoes)since they are pretty demanding, high energy plants. Granted it’s June now; this would have been relevant in Jan. or Feb. my plants are already in soil. I started mine in front of a window and they did fine, if a little stretched out. Come on guys, not everyone who likes indoor/automated gardening grows weed. Nice idea and compact. Thinking about doing this next year after bad luck in simply putting a tray on the window and hoping seeds would sprout (even with a cover and heat mat). I think with the sun moving overhead, it tends to cause seedlings to fall over. Better to have a light source at top all the time. Yes, I’m looking to get licensed to grow medical marijuana so I may build this for myself. The “project cost” of $150 must assume that a lot of the material he calls up is already on hand. 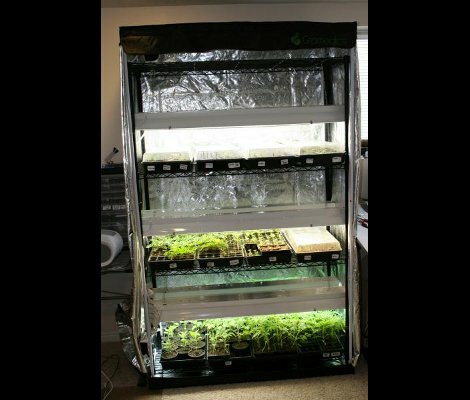 The cheapest grow tent Gromedics sells is $205 all by itself. You are correct, I totally did the price wrong. The stuff I used is higher end, but with cheaper equipment you can easily build yourself the same type of system for 150 – 250. I do appreciate you idea but I don’t think indoor weed growing project is going to open up consumers’ wallets.